Gamber & Community Fire Co. and Sykesville Freedom District Fire Department were alerted for a vehicle collision on Rt. 32 at Pine Knob Rd. in Eldersburg. The call was dispatched on Thursday, May 10 at 4:35 pm. Units arrived on the scene to find a red Toyota under a black Dodge Charger. All drivers and passengers had managed to get out of their vehicles. 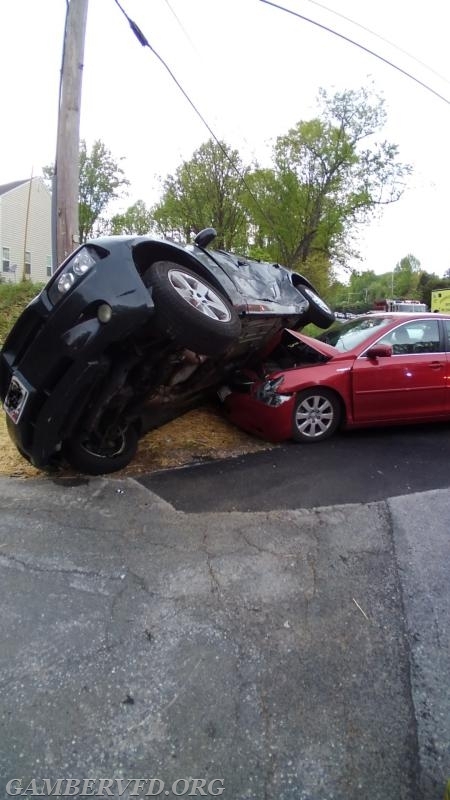 One person was transported to the hospital by Sykesville's Medic Unit. Gamber units cleared the scene within 30 minutes. Maryland State Police were investigating the crash. Very dangerous intersection . Many crashes there over the years.